Are we doing enough to educate our kids about other cultures? 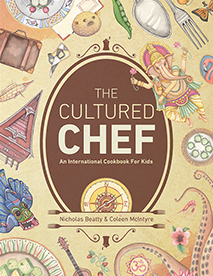 The Cultured Chef: An International Cookbook for Kids was created to stimulate cultural awareness between the ages of 3 and 9. Designed to promote diversity, the book offers wholesome world recipes and stories about life outside the United States. More than just a cookbook, The Cultured Chef takes into consideration a child’s natural curiosity about our world. The book offers ways to stimulate all of a child’s senses through unique recipes, whimsical illustrations, and stories about fascinating people and places around the world. Each illustrated recipe offers easy step-by-step instructions that allow kids to take the driver’s seat in the kitchen, with a supervising adult as their assistant. Readers can choose from a wide assortment of Breakfast, Lunch, Appetizer, Dinner, and Dessert menus. Cooking and cultural education make the perfect partnership. Spending time in the kitchen allows many opportunities to learn life skills such as counting, measuring, and following instructions. While cultural exploration offers an opportunity for children to become healthy and active participants in an ever-shrinking global community. "Phenomenally cute, phenomenally colorful, and phenomenally educational, The Cultured Chef is all around the world FUN."